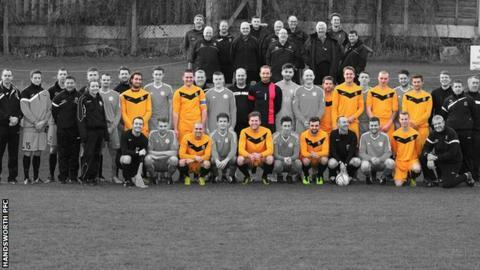 Professional and amateur clubs united over the weekend to mark Football Remembers Week. Several thousand events were held across the UK to mark one of the most iconic moments of World War I, the 1914 Christmas Truce football match. Teams uploaded pre-game photos to social media with the hashtag #footballremembers. These 'Moment in History' pictures are being displayed on a website called www.FootballRemembers.com. The unofficial ceasefire saw British and German soldiers across the Western Front play football together in December 1914. The BBC Sport website has selected a number of the images to publish in the photo gallery below. The Premier League, Football Association and Football League have teamed up with the British Council to deliver the Football Remembers project, which will continue until 2018. More than 30,000 schools were sent an education pack in May. It included resources to help children learn about the Christmas Truce and football's role in recruitment and morale during the First World War. For more information about the Football Remembers project and Football Remembers Week, visit the Football Remembers website.